Avert your eyes, John Cena! 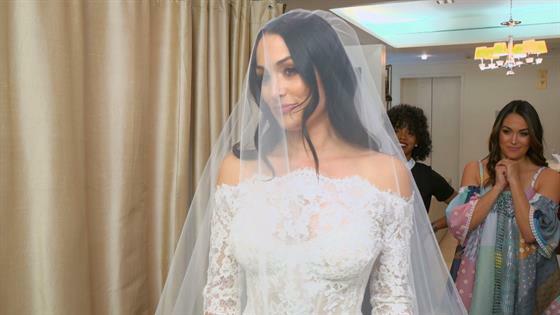 On Sunday's all new episode of Total Bellas, Nikki Bella is in the throes of wedding planning as she begins her hunt for the perfect wedding dress. Thankfully, the WWE star has sister Brie Bella and event planner Bryan Rafanelli at her side to help her make a decision. At first, John's bride-to-be comes out donning a cap-sleeve lace ball gown and couldn't look more beautiful. However, the engaged Bella twin reveals she envisions herself in something with "long sleeves" for her big day. Not to mention, per atelier Mark Ingram, the badass wrestling maven also comes off as "too sweet" in the ensemble. Thus, the dress is given the axe! Since Nikki and John's wedding "compete[s] with the royals," the reality TV veteran next tries on a striking three tier gown with a deep V-neck. While the dress is totally "fabulous" and has "insane" cuts, Brie isn't sold on the look. "I feel like this isn't for your wedding day," Birdie's mom relays. And she isn't the only one against the gown! "It does dictate the style of the wedding," Mark wisely notes to Nikki's wedding guru. "This dress really, you know, is limiting." "I guess it's a good problem to look good in everything, but man it makes the decision hard," Brie jokes in the dressing room. Nonetheless, the fashion show doesn't last much longer as Nikki finds her dream dress in gown No. 3. Stepping out in a strapless floor length lace ball gown with a long-sleeve sweetheart neckline overlay, Nikki is all smiles! "Oh my gosh, I just got goosebumps," the mother of one shares. "It's stunning. I feel like this is exactly what you've been looking for." "I love this," Nikki gushes. "I feel like a Barbie!" Third time's the charm, right? Brie certainly agrees. "It's so funny because you always know when a bride finds her dress," Brie happily states. "When they walk out and it's like this big smile and they feel like a queen, you're just like, 'That's it. That's the smile I've been looking for lately!'" "And I just feel like now we've just made a turn, like things are gonna start feeling really special. Like, 'Hey I'm getting married,'" she concludes about her sister's big day. Join Nikki on her hunt for the perfect dress by watching the clip above!